Powers: Van Adder possesses enhanced strength and toughness, being barely affected by repeated gunshots. He had fangs, and clawed hands and feet. History: Nels van Adder was a former research assistant to Mendel Stromm (I thought, anyway), and he had volunteered to become a test subject for a chemical developed by Stromm and Norman Osborn. (Peter Parker :Spider-Man I#-1) - Police, hunting a serial killer, spotted a suspicious individual lurking outside Osborns plant, it was Van Adder, and he attacked them, before fleeing into the plant. Captain George Stacy led a squad of men into the plant, accompanied by his brother Arthur, Osborns chief of security. Van Adder wounded one of the police with his claws, and fled again. Cornered by the Stacy brothers, he threw Arthur into a stack of crates, and leapt straight through a brick wall, escaping, despite having been shot six times by George Stacy. 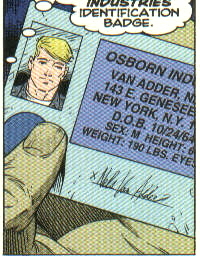 The brothers found his Osborn Industries ID card, which he had dropped. When questioned by Arthur Stacy the next day, Norman Osborn claimed Van Adder to be a disgruntled employee who had left the company months earlier, but refused to talk about what work Van Adder was involved in. That night, Van Adder confronted Osborn in what had been Mendel Stromms old lab, wanting to know what was happening to him, and claiming that he hadnt wanted to kill anyone, but couldnt control himself. Osborn noted that Van Adders transmutations were progressing more quickly than anticipated, and that he had volunteered as a test subject before a stabilising reagent had been developed. Osborn took a sample of blood from him, wanting to find answers on what had gone wrong. Arthur Stacy found documentation that proved Van Adder was still an Osborn employee, working on "Biogenetic Project Supreme". Osborn found him looking through his files, and fired him. An enraged Arthur Stacy later returned, believing Osborn to be involved in criminal activities, breaking into the plant. He was pursued by his brother, who wanted to stop him. They arrived as Van Adder flew into a rage and attacked Osborn, meaning to kill him. Osborn offered Arthur his job back, complete with a substantial bonus if he subdued Van Adder. George shot Van Adder twice, not even slowing him down. He struck George, who broke his leg as he fell. Van Adder returned to attacking Osborn, only to be shot in the back by Arthur, who he then charged at, only to be thrown out of the window by the Stacy brothers, landing in the river, and was presumed dead. Osborn claimed Van Adder to have been experimenting with Stromms biotechnology, and that he had been trying to help him. Van Adder had, however, survived the fall, and escaped. Comments: Created by Howard Mackie and Dan Fraga. How did they ever manage to leave this guy out of the movie? by Gauntlet: Dark Rider , images courtesy of the Squid.